In the fall of 2015, a friend and I went to the Ancient Bristlecone Pine Forest in the White Mountains near Bishop, CA. There was almost no traffic, and I soon found out why. The road we took, the only one to our destination, went from 4,100 ft to 12,000 ft (1,200 m to 3,600 m), uphill all the way, without any dip. It took us almost an hour to get through so many turns that I lost count, before finally finding a place to park on the side of the road, not far from the mountain top. 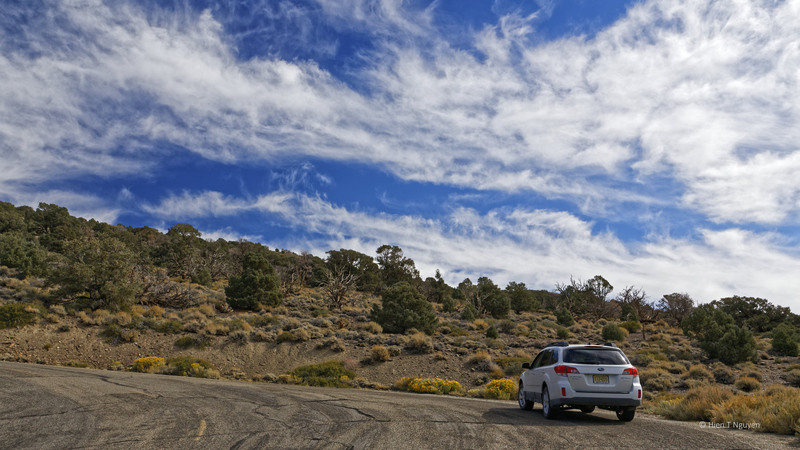 On the way to Ancient Bristlecone Pine Forest near Bishop, CA. I was rewarded with some of the most spectacular vistas that I had ever seen, with bright sunshine, a cool breeze and fantastic clouds that kept swirling in a vibrant blue sky no matter where I turned. Swirling clouds the White Mountains of California, around 10,000 ft (3,000 m). Bristlecone Pines are trees that live at high elevations, as high as 11,200 ft (3,400 m), in extremely harsh conditions with little rainfall, and can be thousands of years old. 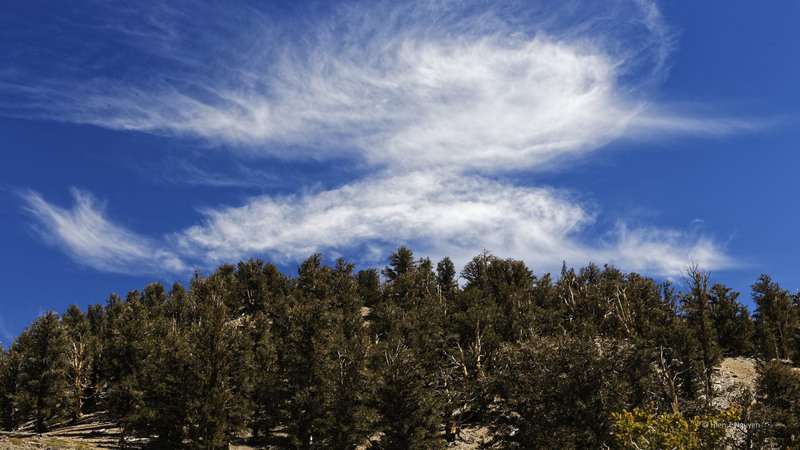 The two oldest trees are 5,065 and 4,847 years old, and their exact locations in the White Mountains of California are kept secret to prevent damage from vandals. We saw Bristlecone Pines at the Ancient Bristlecone Pine Forest in Inyo county in California and at Great Basin National Park in Nevada. Both locations required arduous hikes, especially at Great Basin where the trail kept going up and up the slope of Mt Washington for 1.3 miles! However, it was all worth it. 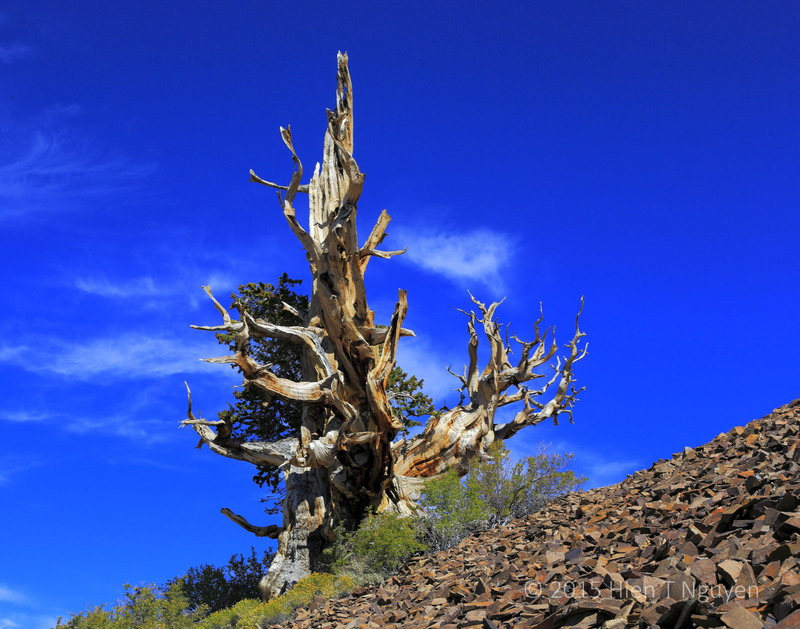 Bristlecone Pine at Schulman Grove in the Ancient Bristlecone Pines Forest near Bishop, CA. 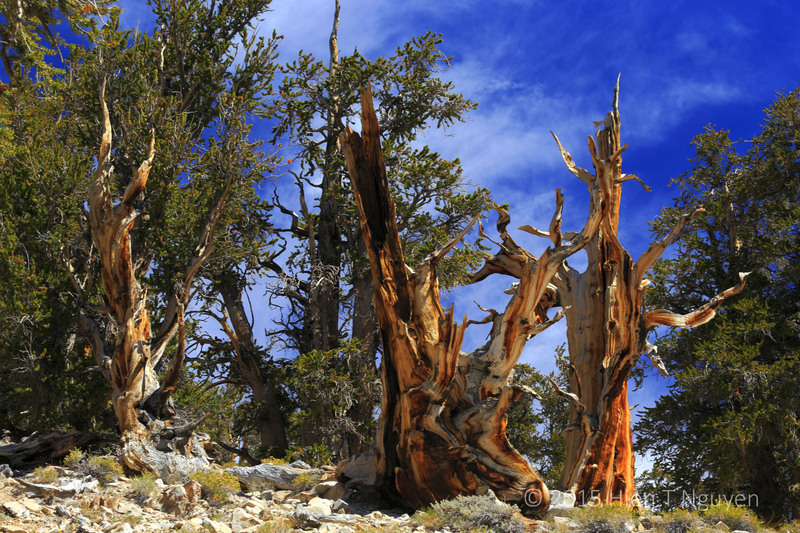 Bristlecone Pines at Schulman Grove. While hiking the Discovery Trail at Schulman Grove, I saw a group of Japanese making a clothing commercial under a Bristlecone Pine. Japanese crew after filming commercial under a Bristlecone Pine at Schulman Grove. 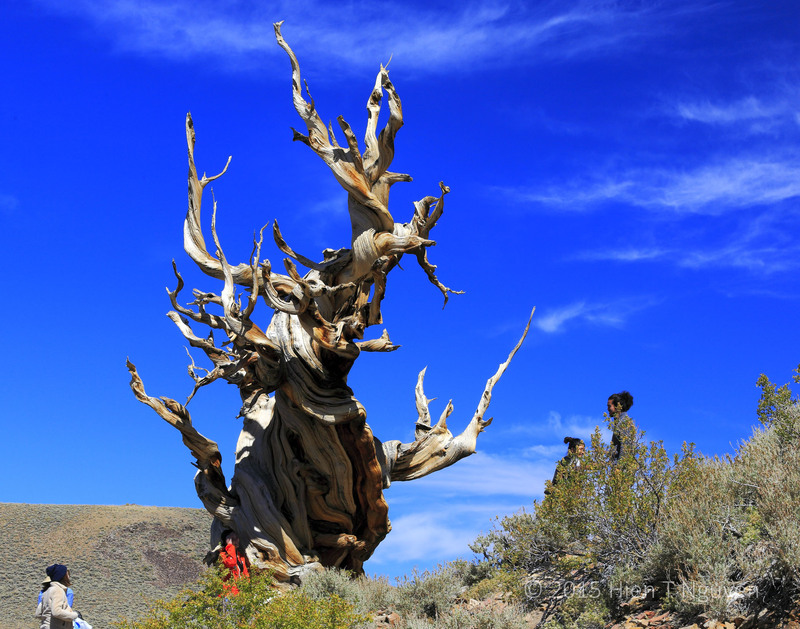 Bristlecone Pine at Schulman Grove used in Japanese commercial. 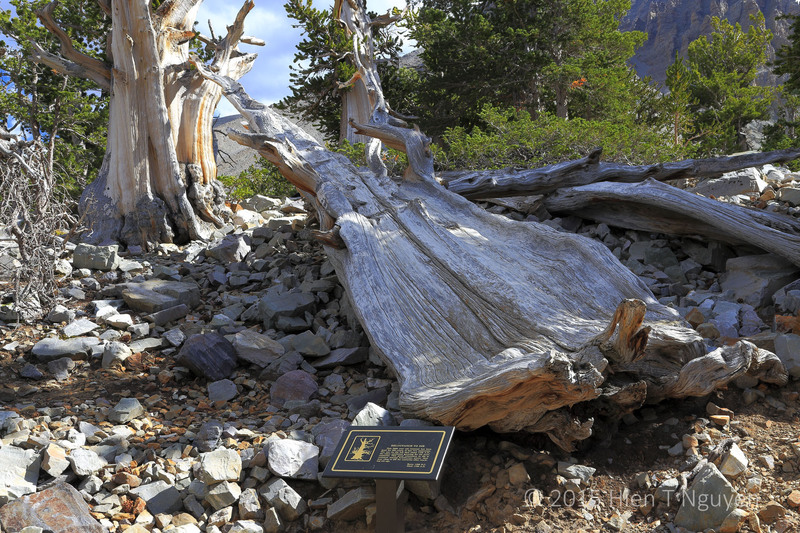 At Great Basin National Park the Interpretive Trail at Bristlecone Pine Grove had signs explaining how the trees grew and died. 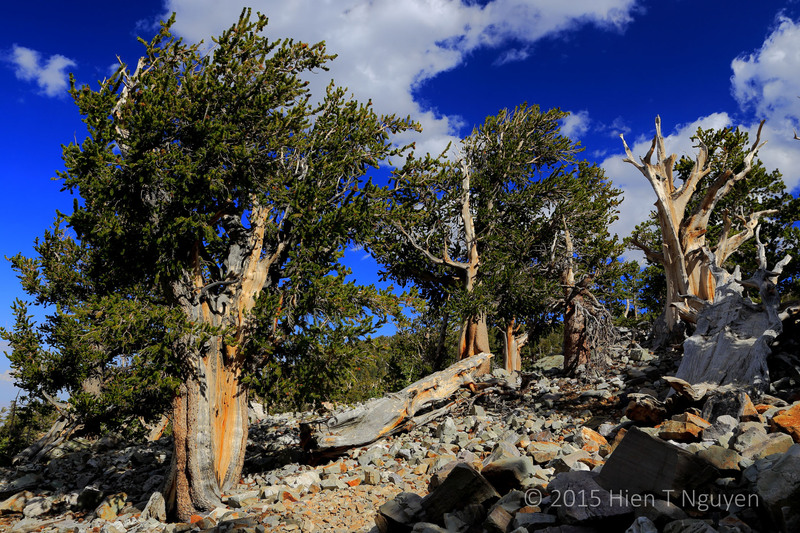 Bristlecone Pines at grove on Mt Washington in Great Basin National Park. 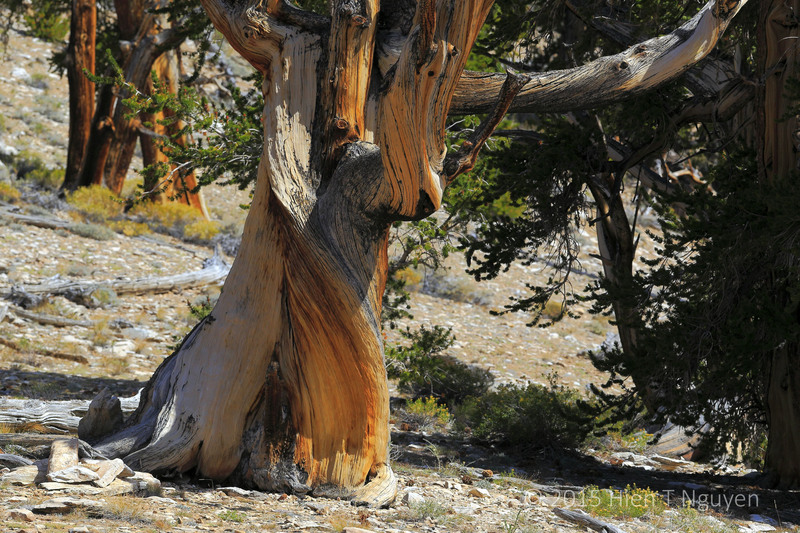 Bristlecone Pine along Interpretive Trail at Great Basin. 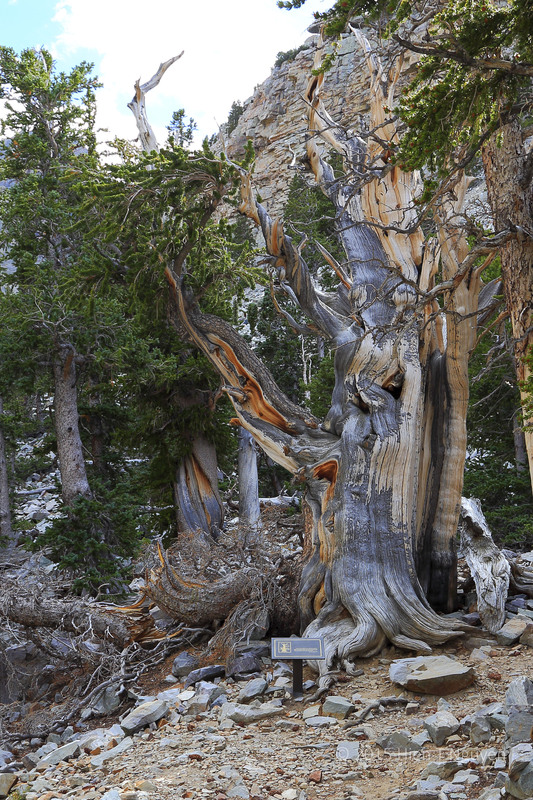 Bristlecone Pines do not hold the record for the oldest living trees. That honor belongs to a group of aspen trees cloned from a single tree, known as Pando or The Trembling Giant near Fish Lake in Utah. The clonal colony covers 106 acres (43 hectares), contains 40,000 trunks, all cloned from the same original tree. Its roots are estimated to be 80,000 years old.